Ladders are used in several home tasks; it might be reaching high places in the house during cleaning or picking up something, however, in most cases ladders are necessary for construction projects. Unfortunately, many fatal accidents have happened due to the laxity of safety rules but some were unavoidable accidents. 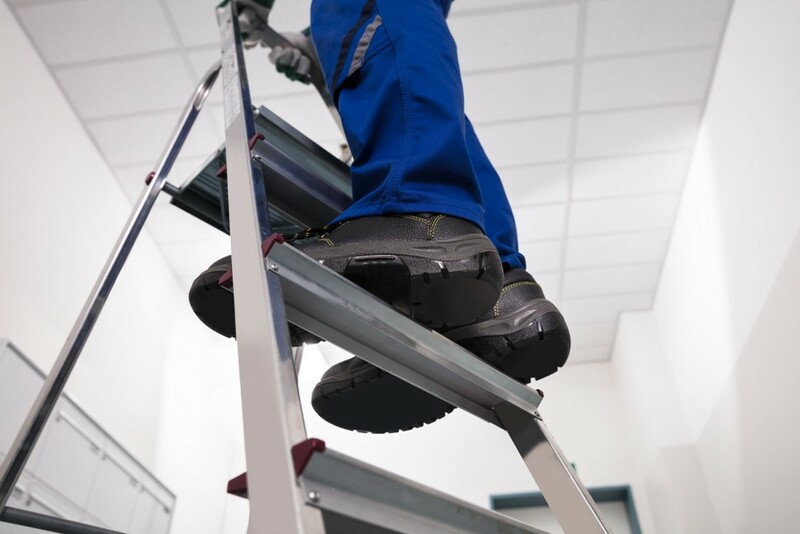 However, we can avoid some of the accidents by following the safety rules and having knowledge on essential things to look out for before buying ladders to ensure they are in good working condition. Before dealing with extension ladders also known as a portable ladder, it is important to have training from a qualified professional. A trained professional will teach you and guide you on how to set up an extension ladder especially in engaging jobs such as house construction or repairs. But before we get into the safety measures lets us first have a clear understanding of the extension ladder and some of its properties. As the name depicts an extension ladder is adjustable, you can change the length of this ladder to suit different heights. A portable ladder either has two or three extensions, the two-section ladder should not be more than 50 feet, and the three-section ladders should not be more than 65 feet. Usually, these are 24 feet for two-sectioned ladders and 48 feet for three-sectioned. Extension ladders should also have an allowance of 3 feet on top to allow the worker have easy access to the roof or project area. Safety rules for using an extension ladder. One of the critical safety measures when it comes to an extension ladder is the set-up, before setting up the ladder check for any defects. Steps on how to set up an extension ladder. Ensure you place the ladder on a firm area, avoid setting up the ladder on slippery ground or leaning it against unstable objects like boxes, tables or carts. It might hinder the stability of the ladder leading to a fall or tipping of the ladder. After setting up the ladder on a robust and stable base, be sure to check the angle, the angle plays a crucial part in maintaining the stability of the ladder. The angle is dependent on the length of the ladder, so remember to pay attention to this key factor. After setting up the ladder, tie on a strong base, this ensures the ladder does not shake even while climbing. Wipe off greasy substance from your working boots, after setting up the ladder, wipe off snow or mud from your shoes, to avoid slipping while climbing. Never carry tools in your hands, you can either use a tool belt or use a hand line. While climbing the ladder always face the ladder and maintain a 3-point contact; these are the two hands and one-foot policy or one hand and two feet policy. It ensures you have a proper grip on the ladder. Always wear safety gear when climbing or using an extension ladder for your work, you need a helmet as well as gloves. Also, make sure to wear the correct clothes and shoes for the job. Things to look out for when buying a ladder. The cost of the ladder, when purchasing anything, the price should be one of the key consideration, the value of a product in some cases determine the durability or ability of an item. In the case of extension ladders, a ladder made from heavy metals will be more durable but cost more. If you are looking for a work ladder that will last longer then work towards saving for a more priced ladder. The condition of the ladder, if an extension ladder has been in the store for too long, there will be traces of rust. Scrutinize the ladder and ensure it is in excellent working condition. The length of the ladder, extension ladders vary in length depending on their task, before buying a ladder have a clear understanding of where you will use it, for home construction or repair ladder, you need a light duty ladder. The material used, an extension ladder can either be made using steel, aluminum or fiberglass. All these materials serve different purposes and produce extension ladders that vary in functions as well as price. Ladders made from steel are in most cases more popular among, warehouses due to their light weight and ability to perform various functions. Extension ladders made from aluminum are light and suitable for home use. Aluminum extension ladders are lightweight and cannot withstand too much pressure; they are also not suitable near electrical wires. Fiberglass, on the other hand, is suitable in wet areas as well as near electrical current. Extension ladders made from fiberglass are suitable for companies since they perform heavy duties and can withstand harsh conditions. The final thing to check before buying a ladder is the weight, as earlier on mention extension ladders vary in length, and this influences the weight of the ladder but also the material used plays a key role. So if you want an extension ladder for home use buys a lightweight ladder, if you want a heavy duty ladder it might weigh more but safer for your tasks. Ladders have caused severe accidents, but it is impossible to work on certain projects without ladders. It is thus essential to comply with the safety rules to avoid major accidents; it is critical for the worker to plan before the work, carry all the needed equipment to prevent compromise. Another critical factor is to check the surrounding area to detect any potential hazards; this will help you identify any electrical wires and avoid them during your work. Also, remember to use the correct ladder for the job. With the above rules you are assured of a safe working environment, and remember to have a good night sleep, eat well for energy and stay well hydrated.